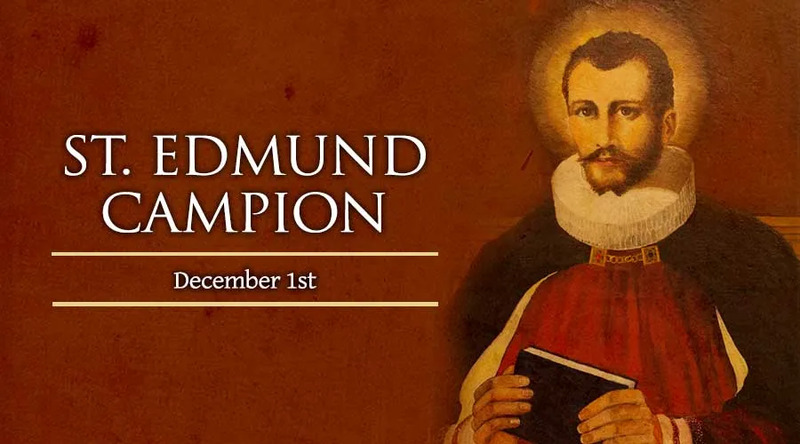 Edmund Campion was born in London on January 25, 1540. He was raised as a Catholic, and had such a powerful and flamboyant intellect that at the age of only 17, he was made a junior fellow at Saint John’s College of Oxford University. On visiting the university, Queen Elizabeth I was so taken by Edmund’s brilliance, as were a few of her dignitaries, that she bid him to ask for anything that he wished. The exaltation and praise of so many fed his vanity and eventually led him away from his Catholic faith. He took the Oath of Supremacy and acknowledged the Queen as head of the church. He also became an Anglican deacon. However, his brilliant intellect and his conscience would not allow him to be reconciled to the idea of Anglicanism for too long. After staying a period of time in Dublin, he turned back to his Catholic faith and returned to England. At this point, he was suspected of being too Catholic, and was shaken when he witnessed the trial of a soon to be martyr. It carried him to the conviction that his vocation was to minister to the Catholic faithful in England who were being persecuted. He also felt the call to convert Protestants. He set off to Rome barefoot, and in 1573, he entered the Society of Jesus. He was ordained in 1578 and had a vision in which the Virgin Mary foretold him of his martyrdom. When he returned to England he made an immediate impression, winning many converts. On July 17, 1581, he was betrayed by one of the faithful who knew his whereabouts, and was thrown into prison. The queen offered him all manner of riches if he would forsake his loyalty to the Pope, but he refused. After spending some time in the Tower of London, he was sentenced to death by hanging, drawing and quartering. His martyrom in Tyburn on December 1, 1581 sparked off a wave of conversions to Catholicism. He was canonized by Pope Paul VI in 1970.